Response to the Aeroprakt A32 ‘Vixxen’ has been nothing short of phenomenal, since the first demonstrator arrived in July 2015. 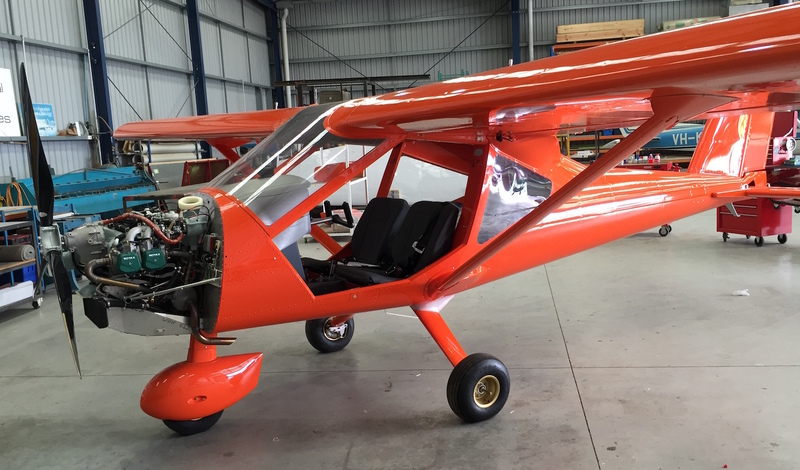 No less than 12 have been ordered through Foxbat Australia, including one to an Australian subsidiary company operating in South Africa. The surprising thing is that sales of the A22LS ‘Foxbat’ have remained unaffected. The most recent A32 arrival – serial number 011 – is in ‘Pumpkin Orange’, a colour which is becoming more popular as an alternative to the more common yellow, white, red and blue. The lucky owner lives out Broken Hill way and after familiarisation training – courtesy of Rob Hatswell at Gawler (north of Adelaide) – he will be flying the A32 largely on farm duties. The aircraft is due for some sprauncy decals in the next couple of days and will hopefully be signed off sometime next week for test flying. Although weather around Melbourne has been a bit tempestuous lately! After the very first A32 arrived here in Mazda Spirited Green Metallic (have a look at the pre-delivery flight test video here: A32 check) it seems that A32 owners like their colours – the next two A32 deliveries, due later in May, are yellow and white, with a bright green one (but not metallic) due early in June.